← Trout Unlimited: Migration Celebration! What is the best time of year to fish the McKenzie and Willamette Rivers? Cloudy days in June when the temperature cracks 65 degrees are pretty hard to beat. Gray and Green Drakes, Pale Morning Duns, Blue Winged Olives, Brown Caddis, and Green Caddis are present. The rivers are generally at “full” levels and the fish are looking up. The plethora of insects and the varied emergence period keeps fishing active all day. We are at that point now and fishing has been nothing short of great. If you have yet to get out and enjoy it, do it asap! Back to the title question of this post. It’s a question we get mostly in reference to guided trips, “when should we come?” When is the best time to come? My answer for years has been May 15 to July 15 and Sept 15 to October 15. Of course these are not absolutes and we do more guided trips in mid summer than any other time. Mid summer is when folks have time and the weather is ideal so it’s a great day out but the hatches and the numbers of really high quality fish are not the same. 2017 is a unique year. We have a ton of water. I don’t see us having the summer “doldrums” that summer low water can create. Increased habitat for fish and bugs, water temperatures that will stay cool throughout, and fishery that really hasn’t had intense pressure on it because of the tough winter and spring conditions equal a really great trout year! Steelhead numbers are incredibly low. Last year this time in June there were roughly 12,000 summer steelhead over Willamette Falls. This year we have 1,000 fish over. Ouch. As stated earlier get out and enjoy this great trout season! 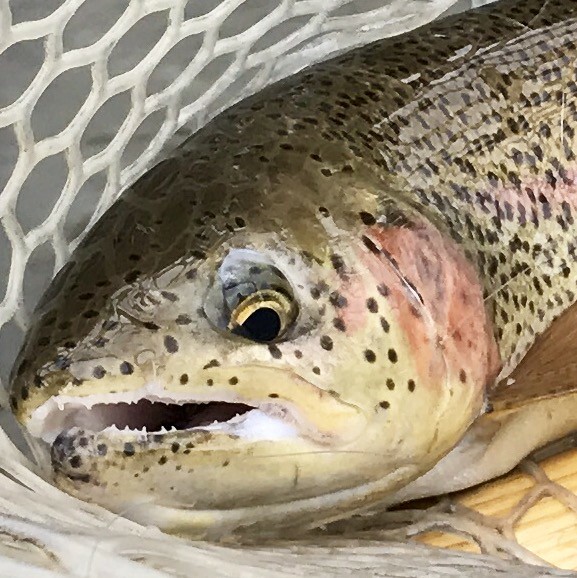 This entry was posted in Fishing Reports, Fly Fishing Travel, Lower Willamette, McKenzie River, Middle Fork Willamette River fishing, Proven Spring Fly Patterns. Bookmark the permalink.